We live and work in the areas we serve and are very familiar with the changing inventory in the entire Lake Minnetonka and Greater Minneapolis area on a daily basis. Are you experienced in Foreclosures and Short Sales? 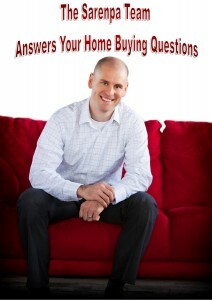 Some agents shy away from foreclosure and short sale homes due to lack of knowledge. The Sarenpa Team makes it a point to stay educated on changes with bank and national policies and programs to ensure that our clients have the opportunity to see and understand a complete picture of the local inventory, pros/cons, & potential timeframes related to the short sale and foreclosure process. Our goal is always to ensure our clients are armed with accurate information to make informed decisions when buying a home. We hold designations in CDPE (Certified Distressed Property Experts) & SFR (Short Sale Foreclosure Resource). Tony Sarenpa, co-owner and lead agent of The Sarenpa Team has been investing in residential real estate since 2001 and selling since 2006. Our commitment to continuing education far exceeds the yearly requirements of the MN Department of Commerce for Realtors. We have received feedback from several clients that says our experience and market knowledge far surpasses the number of years we have been in the business! Our team sells 125+ homes/year; far more than the average real estate agent in Minnesota, which contributes to our above average market experience. The Sarenpa Team consists of listing and buyer specialists who focus their time and training on their specialty (either buyers or sellers); however all agents on the team are cross trained in all areas of the business to allow for a complete understanding of the market. Our team approach allows us to service each client at the highest level. Over the past year, the average number our clients buying a home saw 7 homes before they made a decision. We do an extensive buyer’s consultation up front before we look at homes to determine accurate criteria, focus your search, and respect your valuable time. Due to The Sarenpa Team’s longevity and positive reputation in the real estate industry, we have weeded thru professionals and selected the best people in just about every industry you might need advice on; from carpet cleaners, well, septic and radon inspectors to general and specialty contractors. There is a definite possibility that you could be competing against other buyers. It depends on the individual house and situation. The market is very active right now and we are seeing more and more homes sold with multiple offers every day as inventory decreases and interest rates continue to be incredibly low. Our agent team is trained in expert negotiation strategies that give you a definite advantage against the competition. We do as much digging and research as possible to come up with a professional recommendation. Our negotiating skills and training allow us to approach each unique negotiating situation in a position of strength. Prior to it coming up in negotiations, we discuss with you the possibility of multiple offers and your desired approach. Whenever possible. Most of the time, offers are emailed to the listing agent and then presented to the seller. We sometimes explore other strategies that give us a competitive edge, as the situation requires. What Are the Top Things That Separate You From Your Competition? 1. Real Estate is our Career of Choice. To us, it is beyond a “job”. We love working with people! It is rewarding to help our clients find the perfect home that satisfies their lifestyle. We enjoy the challenge of matching people with what they are looking for regardless of time and effort- our clients should not have to “settle”. The Sarenpa Team is in it for our clients, not the paycheck. It is not just what we do, but it’s who we are! 2. Support of a Team, both Internal and External. Our unique team approach offers unparalleled service to our buyer clients. We are a team of specialists, which means when you work with The Sarenpa Team, you don’t just have a one agent doing everything from searching for properties, negotiating offers, and doing paperwork. You have a team of dedicated specialists to ensure that you are able to see new properties that fit you criteria and schedule, and you also have an expert negotiator on your side at the same time, as well as an administrative team to smoothly handle all the paperwork details. Our internal closing and client care coordinator and marketing team are very attentive to the details of each file and needs of each client.This combination of team specialists allows our clients a higher percentage of accepted offers than the average. The Sarenpa Team also works with a number of trusted professionals to ensure service tailored to suit your needs. 3. Focus on Education. Our focus on education and industry best practices far exceeds the norm in the business of real estate. The Sarenpa Team benchmarks our team against the best practices of the top real estate agents/teams in the country. We attend national education conferences and “mastermind” sessions to stay on top of education and market trends. 4. We offer “On-Call” Service. The Sarenpa Team understands clients’ needs are usually time sensitive and we respect that. We pride ourselves on prompt response time and flexible availability to our clients. Our team approach makes it much easier to accomplish this! What documentation do you gather on a property that I am really interested?